Safe driving is about anticipating what is going to happen before it actually happens. You don’t want to be a solely reactive driver because this puts you at more risk of being in a situation you can’t drive around. Fortunately there are some tell-tale signals that other drivers make when they are about to make a manoeuvre, even before they start indicating. A driver that’s about to move will be looking over their shoulder. Motorcyclists will often take what’s called a ‘lifesaver’ glance over each shoulder before moving. Drivers lacking confidence will often spend far too much time looking over their shoulder, particularly when moving into the left hand lane, trying to find a suitable gap, rather than anticipating traffic using their wing mirror and rear view mirror and indicating. If you are driving near tourist attractions you can make an assumption that if you are following a rental car or campervan that they might turn off. If this is a right turn that means they may need to brake and wait to turn right. If you don’t know the area, watch for tourist signs. Tourists will also be looking for photo opportunities such as rest areas where there are views. They may also drive more gingerly, or be used to driving on the right-hand side of the road. Watch for rental vehicles pulling out of junctions. Always assume that they might pull out onto your side of the road (having accidentally done this myself in Canada, fortunately on a back road). While all modern cars have self-cancelling indicators (except some specialist cars like the Ariel Atom which uses a motorbike system), occasionally drivers will leave them on by accident. Motorbikes’ indicators have to be manually cancelled, however, motorbike riders are more used to having to cancel them. You can mostly trust an indicator that is activated, but if the indicator is already on and you didn’t see it switched on, then this is less trustworthy. If you are turning left, signal left from the left lane. If you are going straight through, use the lane(s) with markings for straight through traffic, don’t indicate on the approach to the roundabout, and as you pass the exit before the one you are taking, indicate left and take the exit. If you are turning right, use the lane(s) with markings for turning right (usually just the right lane), indicate right until you pass the exit before the one you are taking, then indicate left and take the exit. You’ll see when you are approaching an on-ramp that traffic needs to merge like a zip. You can anticipate this (and help traffic flow), by leaving the gap. If you see that it’s a truck then you will need to drop back further and leave more room. 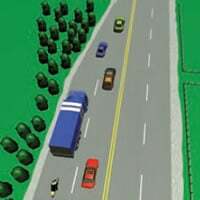 Many drivers wrongly start to move within their lane before they start indicating. If you see a vehicle that has been following a fairly consistent course within a lane suddenly start to drift, they may be about to change lanes. You have a blind spot roughly from your door pillar (the B pillar) back 3-4 metres, depending on how you set your wing mirrors. Before you make a manoeuvre, you’ll check your blind spots. It makes sense, though, not to deliberately travel in other people’s blind spots. Doing so increases the risk they won’t see you. You might see signs showing that there are hidden driveways (concealed exits) to make you aware that a slow vehicle could be exiting or entering a driveway. It’s a good idea to cover the brake in these situations, just in case. Covering the brake means bringing your foot off the accelerator and over the brake, but not braking. Signs indicating sharp bends approaching will mean that traffic ahead will slow down. 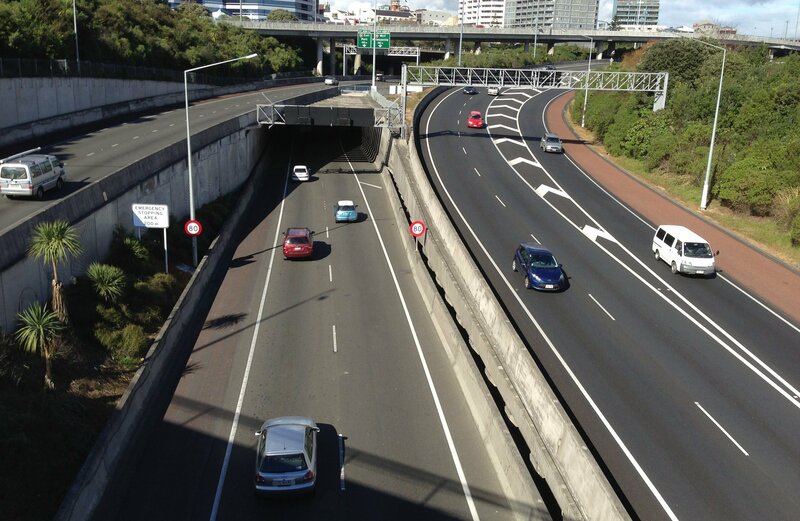 Look out particularly for one-way bridge signs because hidden queues can form, especially on holiday weekends. Check out these signs questions to see if you know your Road Code. In dry clear conditions leaving two seconds between you and the car in front is safe; if it’s wet or you are towing a trailer you should double this. However, what is not so well known is the 10-second scan. It means you should be constantly scanning up to four or five cars ahead of you, i.e. ten seconds up the road. This gives you a huge amount of time to react to any situations that may occur. It will allow you to see when traffic is starting to get backed up ahead and you can anticipate when you’ll need to brake.